Check-in: From 5:45 - 5:59pm sharp, at each tourney. All Grand Prix players must check-in before 6:00 in order to play. Due to pairing restrictions, late arrivals cannot be accommodated, sorry. So, plan to get there early! Energy fee: Everyone, help set up tables, chairs, boards, sets, clocks, and board numbers. Thanks! Grand Prix Prizes: When summer ends, trophies to the Top Five (see below). 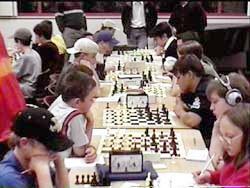 The 2019 Hot Summer Chess rated tournaments are open to any 2nd-12th grade players that desire to play competitive NWSRS rated tournament games. Beginner players are welcome! You need to learn the rules of chess before you arrive. Learn or review the rules of chess here (web page) or here (video) if you wish. Freshly graduated H.S. seniors are welcome to play also. Players will be placed in different playing groups of approximately equal playing ability based on the latest NWSRS ratings. Players will play in 4 player (usually) "Quad" sections. These feature three games, no elimination, with a time control of Game/30 minutes with five second delay per player. The tournaments are rated by the NW Scholastic Ratings System, so tournament rules are in effect: if you touch a piece, you must move it. Experienced players in the top sections will be required to record their moves, so bring a pen or pencil. Score sheets and sets/boards will be provided, but bring a clock if you have one. It's a no elimination tournament, each player can expect to play three rated games each evening. With the exception of the highest rated players, all players should be finished with their three games by 9:00pm. Check-in opens at 5:45 pm and please help with the setup, thank you! Check-in closes at 6:00 pm sharp. Don't be late! The quad format doesn't allow for late entries. Afterwards, please help with setting the room back to its original layout. Thanks! The top five players who accumulate the most points overall in all eight 2019 Hot Summer Chess tourneys will receive trophies, to be awarded at the conclusion of the final Hot Summer Chess VIII. The top scorer will be declared 2019 Hot Summer Chess Grand Prix Champion. The Hot Summer Chess tournaments are directed by Randy Kaech, with assistance from All Of You, and sponsored by the Ferndale Public Library.